Vogel Zoo: Dive baby Dive! 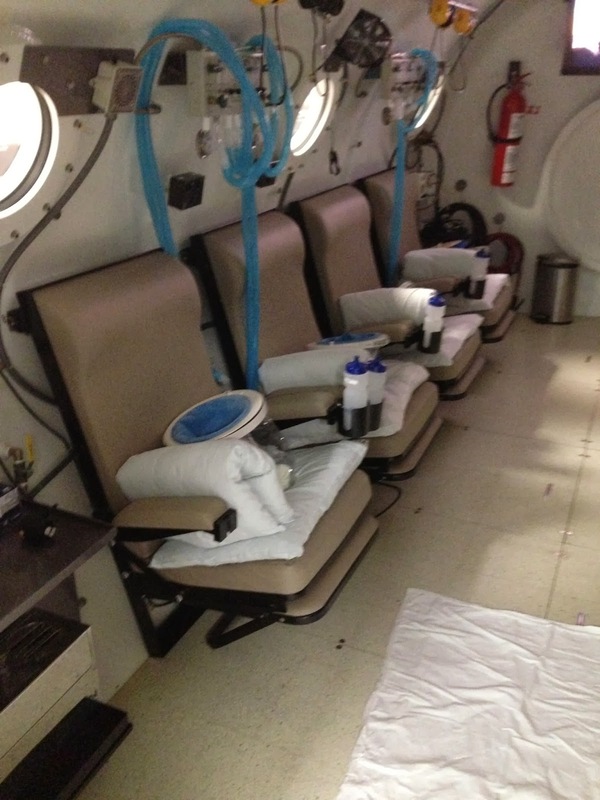 Today I finished my 23rd hyperbaric dive. That means I have spent 46 hours in that tank and watched 90% of 23 movies. Just once I would like to watch the end of a movie. The plan is for 40 dives so I have 17 left. They had told me not to expect much until about dive number 20. I think I started to see some subtle changed around dive 18. Now the changes are beginning to be more distinct and they are changes for the better Yeah! The most important change is in my pain level. Since about Mid July I have been living on a custom topical agent that I have formulated by my pharmacist. If I don't keep my mouth constantly numb I have intense pain that is hard to describe. I guess my best description is that it feels like someone is driving an ice pick through my ear into my tongue. Not pleasant at all. Speaking and eating add to the pain. So, I live on Ibuprophen and Tylenol taken by the clock combined with my topical applied every two hours day and night. Around dive 18 I noticed that I could go a little longer before running for my topical. Next I started skipping ibuprophen doses when I was too busy to take them and... surviving. Last night I woke up when the pain woke me and I thought "I could almost bear this without medication" but then I got up and took some anyway because I am a wimp. Anyway, I am getting better and....I AM SO HAPPY! I love hyperbaric therapy! One of the interesting things about this whole journey are the people that you meet along the way. When I began hyperbaric therapy I was diving with an ENT surgeon. He was out walking his dog when suddenly he went blind in his left eye. He ran to the doctor and the found that his left retina had lost all of it's blood supply. They didn't know if it was a stroke or some other reason that caused the blood to quit flowing. They rushed him to hyperbaric. His wife told me that they couldn't locate their home teachers so they asked the on-call wound care physician and the hyperbaric tech to give him a blessing. (I love living in Utah where you could make such a request and have a high probability that they would both be worthy priesthood holders) So, they gave him a priesthood blessing and put him in the tank. After his second dive 75% of his vision suddenly re-appeared. Subsequent dives continued to show improvement until all he had left was a small dark spot in the center. Another fellow in the chamber knelt down in his workshop and cut his knee. He didn't think much about it until a week later when it started to swell and get red lines. He went to the ER and they began treating him for cellulitus. As he was waiting for another treatment a surgeon happened by, not called for, looked at his leg and said, "This isn't cellulitus, it's flesh eating bacteria!" They took him right into surgery and thanks to their skills and hyperbaric it looks like he won't lose his leg. Anyway, the stories go on and on. 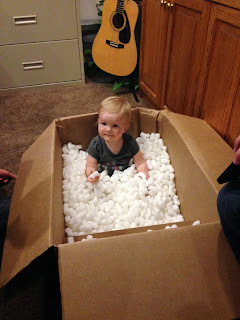 Look what we found in the packing peanuts! I am grateful to live when I do and to have such miraculous treatments available. My tongue and ear are grateful too. My dear little grand daughter has begun to walk. She is so proud of herself. I am so grateful to be alive to watch the miracle of her little life unfold. I am so happy for you, Eric! Yay!!!! You are such an amazing example of enduring. Thanks. Good luck, Eric. I hope this continues to work and you can be pain-free soon. I'm thrilled that something is helping with the pain. What cool pictures! I especially love the last little peanut in the peanuts pic. Love you Uncle Eric. YEAH!!!! I am so glad you are finding relief and a silver lining. You are a rock star!! !